Authorities at the Port of New York and New Jersey seized approximately 3,200 pounds of cocaine from a shipping container on Feb. 28. Sixty packages of cocaine were seized from a shipping container at the Port of New York/Newark. Officials carried out an inspection of the shipment after they noticed tampering of several containers on a large vessel traveling from Buenaventura, Colombia, Drug Enforcement Administration special agent in charge Ray Donovan told NPR. That is when they discovered the nearly ton and a half of cocaine with an estimated street value of $77 million. The bust was part of a joint operation of the DEA, Customs and Border Protection, Coast Guard, Homeland Security Investigations, New York Police Department and New York State Police. “This interception prevents a massive quantity of drugs from getting to the streets and in the hands of our children,” said Troy Miller, CBP Director of New York Field Operations, in a statement. The shipment was intercepted when the vessel stopped over in New York/Newark on its way to Antwerp, Belgium. It contained a legitimate shipment of dried fruit, Donovan said. It is unclear whether the drugs were destined for the U.S., or meant to continue on to Europe. Donovan said the shipment is part of a larger trend in higher cocaine usage in recent years. 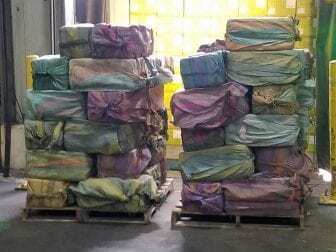 “The cocaine market is coming back,” he said, adding that authorities seized about 26,500 pounds of cocaine in 2018. On a national level, the volume of drugs seized at ports of entry and in the field has been fluctuating. Officials at the borders seized 6,550 pounds of cocaine in 2018, down from 9,346 pounds in 2017, but up from 5,473 pounds in 2016. Donovan also noted a growing trend in cocaine laced with fentanyl, a powerful opiate often used as a cheap, more potent alternative to heroin.